Join our guests Chase Bailey and his mother, Mary Bailey, for a wonderful show about living and thriving with autism. Chase is a food enthusiast, TV host and filmmaker, who loves great entertainment, meeting fun and interesting people, traveling to amazing places, and helping others achieve their own dreams. He also happens to have autism. 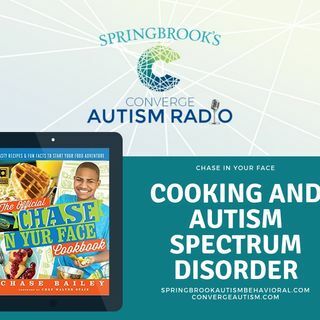 You can learn more about his challenges with autism in The Official Chase ‘N Yur Face Cookbook. Chase hosts his own YouTube cooking show featuring prominent ... See More chefs and other food enthusiasts; speaking at various events and conferences; and establishing his Chase Yur Dreams Foundation. He has been featured in GE’s Our American Kitchen series, radio interviews, numerous magazines and newspapers worldwide; and made appearances on The Meredith Vieira Show and The Chew. He was even honored with the 2017 Legacy Champion Award for his ambassadorship on behalf of the autism community. Mary Bailey is an Executive Producer, Consultant, Keynote Speaker, Co-Founder & President of Chase Yur Dreams Foundation, & Writer, who has contributed to HuffPost on the subjects of parenting, autism, and diversity & inclusion related topics. Mary’s teenage son Chase Bailey was diagnosed with autism at the age of 2. Together they have been keynote speakers for special events; featured in radio, magazine interviews & newspapers worldwide; & on The Chew & The Meredith Vieira Show, where they have shared their journey to success with autism.